Photo courtesy of Reverend Timothy. I’m telling you the thing jumped out! I’m not crazy! I’m definetly out of my minds. The sad thing is, I’m guessing this was conceived with a “seem to be out of their minds” target demographic. Another low blow for the magic industry. I never even had that idea until they warned me not to. 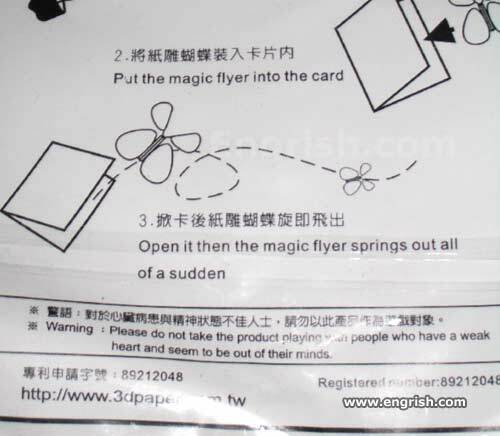 “Died of a heart attack from fake paper butterfly.” No, that wouldn’t look good under my obituary photo. as though I hadn’t expected it to fly out. @Lora talk about the butterfly effect! Just … Don’t put it.